Fundamental to the understanding of contemporary Iran is a proper appreciation of the two Twentieth-Century revolutions that changed indelibly the nature of political rule in the country. Each of these events, the Constitutional Revolution (1905–1911) and the Islamic Revolution (1978–1979), reflected the culmination of several decades of interaction between traditional elements of Iranian society and forces of modernity and change; each of them also saw the coalescence of a familiar coalition of internal actors: the clerical establishment, the mercantile class, and the intelligentsia. In this class, we shall follow the internal developments of Iran as it went from Qājār autocracy in the Nineteenth Century to the Islamic Republic today. Specific topics of discussion include the Bābī revolt, the Tobacco Protest, the Constitutional Revolution, the attempted coup by Moḥammad Moṣāddeq, the 1955 anti-Bahāʾī pogrom, and the Islamic Revolution. Ultimately, we shall shed light on the red thread running throughout all of these events: the tension between the political and religious authorities in Iran. This course represents a combination of a lecture and seminar approaches and individual participation in class dialogues is critical. Each student will have the opportunity to lead a classroom discussion revolving around the assigned readings. Students will write two papers for this class: a mid-term paper on an assigned topic and a research paper on a topic of choice. Students will be evaluated on the basis of four factors: (1) participation (20%), (2) mid-term paper (25%), (3) seminar presentation (25%), and (4) a research paper (30%). Given the importance of discussion, students are expected to have read the assigned reading in advance of each class. Recommended readings are not required, but are offered for those seeking further depth, as a starting point for research papers, and as a highly-encouraged resource for those leading the daily conversations. At the end of this course, it is hoped that students will have not only a better understanding of modern Iran, but have developed better research skills, practiced critical thinking, and gained experience collecting and presenting information clearly. Arjomand, Saïd Amir. The Turban for the crown: The Islamic revolution in Iran. New York City & Oxford: Oxford University Press, 1988. Keddie, Nikki Ragozin. 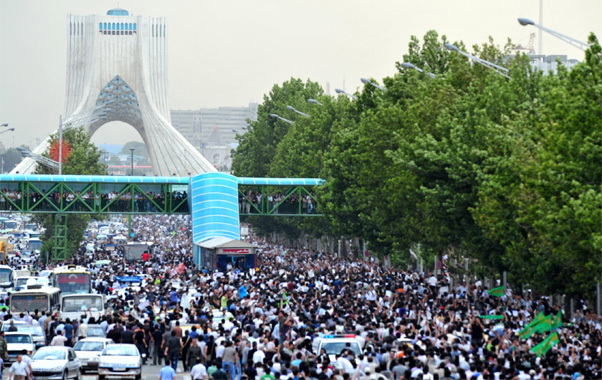 Modern Iran: Roots and results of revolution. New Haven: Yale University Press, 2003. David Orrin Morgan, Medieval Persia, 1040–1797 (London & New York City: Longman, 1988), 8-24. William Montgomery Watt, ‘The Significance of the early stages of Imami Shiʿism’, in Religion and politics in Iran: Shiʿism from quietism to revolution, ed. Nikki Ragozin Keddie (New Haven: Yale University Press, 1983), 21-32. Michael G Morony, ‘Religious communities in late Sasanian and early Muslim Iraq’, Journal of the Economic and Social History of the Orient 17.2 (May 1974), 113-135. ʿAbd ol-Ḥosayn Zarrīnkūb, ‘The Arab conquest of Iran and its aftermath’, in The Cambridge history of Iran, ed. Richard Nelson Frye, vol. 4, From the Arab invasion to the Saljuqs (Cambridge: Cambridge University Press, 1975), 1-56. David Orrin Morgan, Medieval Persia, 1040–1797 (London & New York City: Longman, 1988), 112-123. Sholeh A Quinn, ‘Iran under Safavid rule’, in The New Cambridge history of Islam, ed. David Orrin Morgan and Anthony Reid, vol. 3, The Eastern Islamic world Eleventh to Eighteenth Centuries, (Cambridge: Cambridge University Press, 2010), 203-238. Gavin R G Hambly, ‘Āghā Muḥammad Khān and the establishment of the Qājār dynasty’, in The Cambridge history of Iran, ed. Peter Avery, Gavin R G Hambly and Charles Peter Melville, vol. 7, From Nadir Shah to the Islamic Republic, (Cambridge: Cambridge University Press, 1991), 104-143. Richard Tapper, ‘The Tribes in Eighteenth- and Nineteenth-Century Iran’, in The Cambridge history of Iran, ed. Peter Avery, Gavin R G Hambly and Charles Peter Melville, vol. 7, From Nadir Shah to the Islamic Republic, (Cambridge: Cambridge University Press, 1991), 506-541. Hamid Algar, ‘Religious forces in Eighteenth- and Nineteenth-Century Iran’, in The Cambridge history of Iran, ed. Peter Avery, Gavin R G Hambly and Charles Peter Melville, vol. 7, From Nadir Shah to the Islamic Republic, (Cambridge: Cambridge University Press, 1991), 705-731. Saïd Amir Arjomand, The Shadow of God and the Hidden Imam: Religion, political order, and societal change in Shiʿite Iran from the beginning to 1890 (Chicago: University of Chicago Press, 1984), 238-249. Saïd Amir Arjomand, ‘The Shiʿite hierocracy and the state in pre-modern Iran: 1785–1890’, Archives européenes de sociologie 22.1 (1981), 40-78. Abbas Amanat, Resurrection and renewal: The Making of the Babi movement in Iran, 1844–1850 (Ithaca: Cornell University Press, 1989), . Moojan Momen, ‘Usuli, Akhbari, Shaykhi, Babi: The Tribulations of a Qazvin family’, Iranian Studies 36.3 (September 2003), 317-337. Peter Smith, The Babi and Bahaʾi religions: From messianic Shiʿism to a world religion (Cambridge & New York City: Cambridge University Press, 1987), 5-30, 48-56. Saïd Amir Arjomand, The Shadow of God and the Hidden Imam: Religion, political order, and societal change in Shiʿite Iran from the beginning to 1890 (Chicago: University of Chicago Press, 1984), 250-257. Mangol Bayat-Philipp, Mysticism and dissent: Socioreligious thought in Qajar Iran (Syracuse: Syracuse University Press, 1982), 87-131. Moojan Momen, ‘The Social basis of the Bābī upheavals in Iran (1848–53): A Preliminary analysis’, International Journal of Middle East Studies 15.2 (May 1983), 157-183. Hamid Algar, Religion and state in Iran, 1785–1906; The Role of the ulama in the Qajar period (Berkeley: University of California Press, 1969), 82-102. Abdul-Hadi Hairi, ‘European and Asian influences on the Persian Revolution of 1906’, Asian Affairs 6.2 (June 1975), 155-164. Charles Issawi, ‘European economic penetration, 1872–1921’, in The Cambridge history of Iran, ed. Peter Avery, Gavin R G Hambly and Charles Peter Melville, vol. 7, From Nadir Shah to the Islamic Republic, (Cambridge: Cambridge University Press, 1991), 590-607. Rose Louise Greaves, ‘British policy in Persia, 1892–1903—I’, Bulletin of the School of Oriental and African Studies 28.1–2 (1965), 34-60, 284-307. Shaul Bakhash, ‘The Evolution of Qajar bureaucracy: 1779-1879’, Middle Eastern Studies 7.2 (May 1971), 139-167. Peter Chelkowski, ‘The Iranian colony in Istanbul: Some aspects of its influence on the homeland’s culture and politics’, in Cultural horizons, ed. Jayne L Warner, vol. 1, A Festscrhift in honor of Talat S. Halman (Syracuse: Syracuse University Press, 2001), 69-75. Fariba Zarinebaf, ‘From Istanbul to Tabriz: Modernity and constitutionalism in the Ottoman Empire and Iran’, Comparative Studies of South Asia, Africa and the Middle East 28.1 (2008), 154-169. Mangol Bayat-Philipp, ‘The Concepts of religion and government in the thought of Mîrzâ Âqâ Khân Kirmânî, a Nineteenth-Century Persian revolutionary’, International Journal of Middle East Studies 5.4 (September 1974), 381-400. Nikki Ragozin Keddie, ‘Religion and irreligion in early Iranian nationalism’, Comparative Studies in Society and History 4.3 (April 1962), 265-295. Azriel Karny, ‘The Premiership of Mirzā Hosein Khān and his reforms in Iran, 1872–1873’, Asian and African Studies 10.2 (1975), 127-156. Mehrdad Kia, ‘Constitutionalism, economic modernization and Islam in the writings of Mirza Yusef Khan Mostashar od-Dowle’, Middle Eastern Studies 30.4 (October 1994), 751-777. Anja Pistor-Hatam, ‘Iran and the reform movement in the Ottoman Empire: Persian travellers, exiles and newsmen under the impact of the Tanzimat’, in Societas Iranologica Europaea: Proceedings of the Second European Conference of Iranian Studies (Bamberg, 30 September–04 October 1991), ed. Bert G Fragner (Rome: Istituto Italiano per il Medio ed Estremo Oriente, 1995), 561-578. Nikki Ragozin Keddie, ‘The Origins of the religious-radical alliance in Iran’, Past and Present 34 (July 1966), 70-80. Ann Katharine Swynford Lambton, ‘The Tobacco Régie: A Prelude to revolution’, in Qājār Persia: Eleven studies (Austin: University of Texas Press, 1988), 223-276. Mansoor Moaddel, ‘Shiʾi political discourse and class mobilization in the Tobacco Movement of 1890–1892’, Sociological Forum 7.3 (September 1992). Ann Katharine Swynford Lambton, ‘Social change in Persia in the Nineteenth Century’, in Qājār Persia: Eleven studies (Austin: University of Texas Press, 1988), 194-222. Ervand Abrahamian, ‘The Causes of the Constitutional Revolution in Iran’, International Journal of Middle East Studies 10.3 (August 1979), 381-414. Gad G Gilbar, ‘The Big merchants (tujjār) and the Persian Constitutional Revolution of 1906’, Asian and African Studies 11.3 (1976), 275-303. Abdul-Hadi Hairi, ‘Why did the ʿulamāʾ participate in the Persian Constitutional Revolution of 1905–1909?’, Die Welt des Islams 17.1–4 (1976–1977), 127-154. Gavin R G Hambly, ‘The Pahlavī autocracy: Riżā Shāh, 1921–1941’, in The Cambridge history of Iran, ed. Peter Avery, Gavin R G Hambly and Charles Peter Melville, vol. 7, From Nadir Shah to the Islamic Republic, (Cambridge: Cambridge University Press, 1991), 213-243. Mark J Gasiorowski, ‘The 1953 coup d’etat in Iran’, International Journal of Middle East Studies 19.3 (August 1987), 261-286. Moyara de Moraes Ruehsen, ‘Operation “Ajax” revisited: Iran, 1953’, Middle Eastern Studies 29.3 (July 1993), 467-486. Homa Katouzian, ‘Mosaddeq’s government in Iranian history: Arbitrary rule, democracy and the 1953 coup’, in Mohammad Mosaddeq and the 1953 coup in Iran, ed. Mark J Gasiorowski and Malcolm Byrne (Syracuse: Syracuse University Press, 2004), 1-26. Roy Parviz Mottahedeh, The Mantle of the Prophet: Religion and politics in Iran (New York City: Pantheon Books, 1985), 115-133. Shahrough Akhavi, Religion and politics in contemporary Iran: Clergy-state relations in the Pahlavī period (Albany: State University of New York Press, 1980), 60-90. Roy Parviz Mottahedeh, The Mantle of the Prophet: Religion and politics in Iran (New York City: Pantheon Books, 1985), 213-237. Majid Yazdi, ‘Patterns of clerical behavior in postwar Iran, 1941–1953’, Middle Eastern Studies 26.3 (July 1990), 281-307. Roy Parviz Mottahedeh, The Mantle of the Prophet: Religion and politics in Iran (New York City: Pantheon Books, 1985), 311-336. Gavin R G Hambly, ‘The Pahlavī autocracy: Muḥammad Riżā Shāh, 1941–1979’, in The Cambridge history of Iran, ed. Peter Avery, Gavin R G Hambly and Charles Peter Melville, vol. 7, From Nadir Shah to the Islamic Republic, (Cambridge: Cambridge University Press, 1991), 244-296. Roy Parviz Mottahedeh, The Mantle of the Prophet: Religion and politics in Iran (New York City: Pantheon Books, 1985), 287-311. Michael M J Fischer, Iran: From religious dispute to revolution (Cambridge & London: Harvard University Press, 1980), 181-231. Saskia Maria Gieling, Religion and war in revolutionary Iran (London & New York City: I B Tauris, 1999), 12-39. The Islamic Republic of Iran, 1979–? Nikki Ragozin Keddie, ‘Culture and politics in Iran since the 1979 Revolution’, in The New Cambridge history of Islam, ed. Robert W Hefner, vol. 6, Muslims and modernity: Culture and society since 1800, (Cambridge: Cambridge University Press, 2010), 438-472. Olivier Roy, ‘The Crisis of religious legitimacy in Iran’, Middle East Journal 53.2 (Spring 1999), 201-216. Jahangir Amuzegar, ‘Iran’s theocracy under siege’, Middle East Policy 10.1 (Spring 2003), 135-153. Research paper due at end of term.